Garlic chopped – 1/2 tsp. 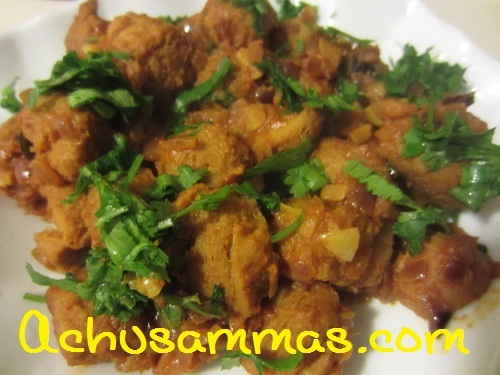 Ginger chopped – ½ tsp. · Wash soya chunks then soak in hot water for ½ an hour. Squeeze all water well. 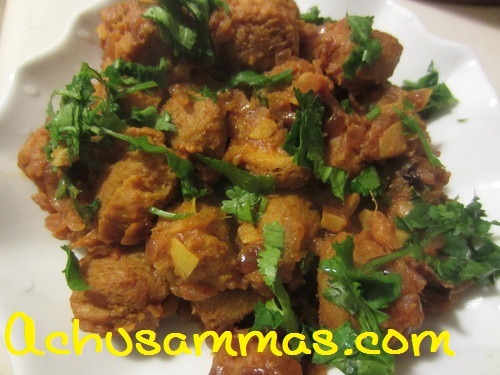 · Pressure cook the soaked soya chunks with water and salt for 1-2 whistles and keep aside. · Heat oil in a pan add onion, little salt and and sauté till onions turn light brown in color. Now add ginger and garlic and sated for a second. · Add tomato and fry till tomatoes are done. · Add all powders and fry at low heat till raw smell goes. 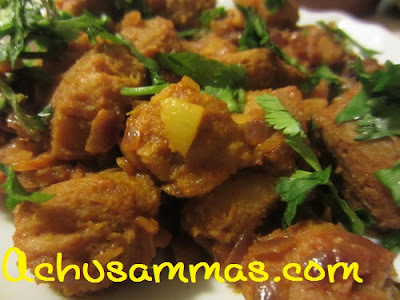 · Finally add cooked soya chunks into above masala mix and mix well, just springle little water, close the lid and cooked 5-10 minutes at low heat. Very delicious n healthy roast,yummy!! Very healthy one, should taste great with some rotis..